Save for a couple of instances, episodes of NXT after TakeOver can be tricky. To be very blunt, these don't really interest me, unless someone makes a big return or a huge debut. When I learned that a tag team match between Heavy Machinery and Riddick Moss & Tino Sabbatelli was main eventing the TakeOver Aftermath episode (H/T Mauro Ranallo for the term), the first thing I thought of was "Why?" I never asked for a rubber match between the two teams that I don't necessarily hate, but don't really care about that much. I ended up watching the whole thing anyway, and when Hanson and Rowe walked through the ramp to crash the party, that was when I realized why they were in the main event: it was all about the debut of the big boy tag team, The War Raiders. And boy, crash the party, they did. Fallen bodies were everywhere, and the big lads immediately displayed why they are one of the best beefy tag teams in the world. 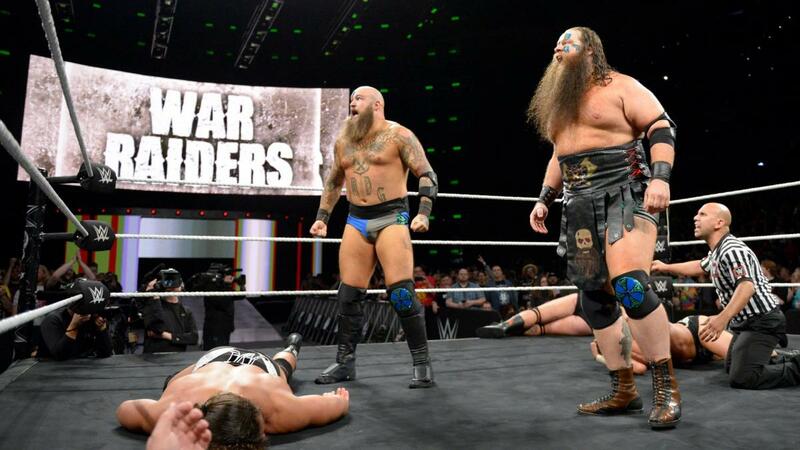 Again, very wise part on them for debuting the Tag Team Formerly Known as War Machine before TakeOver: New Orleans and in front of an excited crowd. It's great that they attacked both teams too, since it seemed like they don't want to force Hanson and Rowe into heel or babyface boxes for the meantime. On the other hand, Kairi Sane and Lacey Evans had a hard-hitting match, and I'm all for a ruthless, brutal Lacey Evans, who will do everything to get a W.
As someone who's very likely to be in the line for an opportunity for the NXT Women''s title, the Pirate Princess took home the win here, but the Lady of NXT's loss did a lot for her compared to the first few matches she had as a heel. Not quite there yet, but I'm glad that she had a ton more action, rather than losing via rollup. With the departure of Ember Moon to RAW, no doubt that Kairi's the top babyface now, but here's to hoping that Lacey will also be a part of the title mix in the future. In-ring action for this week was fine, and that's usually how it goes with the post-TakeOver episode. If you're urging a friend to get into NXT, then this is a good start with all the highlight videos that made up the majority of this episode. If they ask for more, watch TakeOver: New Orleans with them as we wait for a new era of NXT next week. This gets a B-.